Découvrez les principaux sites touristiques de l'île du Sud lors de ce voyage guidé en petit groupe de 10 jours qui comprend le transport et l'hébergement pour neuf nuits. Observez les glaciers, admirez la vue sur la côte et promenez-vous dans des sentiers de randonnée avant de passer vos soirées de détente dans votre hébergement en forêt tropicale et plus encore. Profitez d'une balade à vélo pittoresque et osez sauter du site de saut à l'élastique d'AJ Hackett avant de visiter Queenstown, le mont Cook, etc. 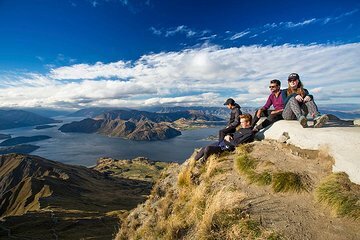 Trip takes you to major touristy attractions in South Island. Scenery is breathtaking at every corner, tour provided opportunities to participate optional activities, ie. Glacier Hiking, Bungy Jumping, etc. However, the tour itself has several issues. For one, the 10-Day South Island advertisement is deceiving. Tour titled 10-Day, in reality is a 9-Day tour, all travelers are dropped off early afternoon on the 9th day to the lodging, that is the end of the tour. More to the issue is the activities of 9th day descripted in the advertisement/itinerary did not happened ie. ice-skating, snow tubing or swim at the hot springs. On the 9th day from Mount Cook to Christchurch, we only made two stops, one by the lake for photo shoots, and one in town for lunch. Tour guide drove directly to Christchurch, dropped us off early afternoon, and that was the end of the tour, provided the overnight lodging is covered by the tour. Second issue about the tour is it is not dedicated to the 10-Day tour travelers. The tour operator used the same bus to provide transportation for the other travelers who are “hop-on” for a segment of the trip as well, and “hop-off” at any time at a designated stop. Travelers who booked this 10-Day tour often found themselves struggling with seating in a congested bus with unscheduled travelers who “hopped-on”. Travelers often sat side by side with one and another, with carry-on bags placed on their laps or feet, which is very uncomfortable considering the drive is often long throughout the day. The other downside is the tour guide was changed out in the middle of the trip, it would be nicer to keep the same tour guide throughout the trip since he/she would already know all travelers, so group would not need to get re-accustomed again. Last, some of the accommodation used during this trip were unsanitary, bed sheets and pillow cases were matted with hairs. Overall, I enjoyed the sight scenes and tour activities, however, there are many improvements about the tour’s logistics could be re-worked to make the travelers not feeling being cheated. Great Trip to see some of the highlights of the South Island. There was some areas of the trip where we stayed in remote areas that would have been better if we drove an extra 2 hours for a better town to adventure in, but nether the less a great trip!